Those who labor diligently to develop their small farm or garden want to protect their harvests from threat and destruction. To this end, they may choose to invest in chemical herbicides and insecticides to ward off the damage done to plants by garden pests and weeds. As the old saying goes, however, the path to hell is paved with good intentions. While chemical pesticides get the job done, they leave havoc in their wake. For example, chemical residues can pollute the air and taint the water supply through runoff. Insecticidal soap, by contrast, dispatches the bugs with few side effects. What Exactly Is an Insecticidal Soap? Insecticidal soap is a combination of ecologically safe ingredients – fatty acids and some form of alkali – that kill off harmful insects without leaving any toxic residue or unhealthy traces. Should birds or animals be exposed to it, for instance, they will suffer no ill effects nor will the air or water suffer any detriment. Rather than attacking the nervous systems of the offending pests, as chemical treatments do, insecticidal soaps terminate them in three ways: they inhibit bugs’ respiratory function, they rupture the cellular membranes, and they dehydrate the vermin by peeling off their protective coatings. They kill bugs dead. As noted, a primary ingredient in insecticidal soap is fatty acid. The fatty acids that work best for soap-making are linoleic acid, lauric acid, myristic acid, oleic acid, stearic acid and palmitic acid. Each of these contributes to varying degrees of lather, astringency and adhesiveness. They can be found in vegetable or animal fats like canola oil, olive oil, coconut oil, palm oil, peanut oil or lard. Lard and olive oil, for example, are highest in oleic acid while coconut oil has the highest concentration of lauric acid. Although these distinctions need not matter at the outset of soap-making and applying, they are helpful to bear in mind if the initial soap in not getting results. Tweaking the formula is normal for environmentally conscious gardeners. That said, almost any commonly used animal or vegetable fat will do. Begin with a cup and mix in a tablespoon of all-natural liquid soap. Why all-natural soap? The simple answer is the all-natural soap lacks certain components that would defeat the ecological purpose of using insecticidal soap in the first place. These include chemical preservatives known as parabens; phthalates, additives that may be carcinogenic; petrochemicals – these speak for themselves; synthetic perfumes that contain numerous allergens; and synthetic dyes that have been linked to human illnesses. This soap can itself be home made but it is also available in stores at reasonable prices. It can be hand soap or dish soap (not detergent), as long as it contains no extraneous chemical presence. Yet it begs the question: why should it take soap to make soap? The straight answer is that insecticidal soap is more than just soap. In this case, the all-natural liquid soap acts as binder and alkali for the other ingredients. The good news is that it is both inexpensive and completely harmless. To the oil and the alkali, a mandatory partner is water, i.e. one cup for every two teaspoons of oil and pure soap. The reason can be put in one (not so) simple word: saponification. This word refers to the chemical reaction between the fatty acid in the oil and the alkali of the all-natural soap, which needs to dissolve for the process to take place. Here is where the water comes in: as a solvent in which the base – contained in the soap – can best diffuse for molecular interaction with the acids. Here again, pure water free from any other substance is optimal for best results. Water also serves as the vessel through which the active ingredients move and spread about the plant. Although some DIYers practice “water discounting,” or using less water for faster saponification, insecticidal soap must be sprayed and discounting may cause the soap to harden. Extra Water – Different plants react differently to insecticidal soap. Some are far hardier than others. Because of this, gardeners do well to test the effects of the soap on one or two sample plants. Tomatoes and certain conifers, for example, are more sensitive. If plants are harmed after application, dilute the solution with more water. Pepper or Garlic – a teaspoon this will help to inhibit the activity of chewing insects with two opposing mandibles. Examples of these include pillbugs, bagworms and grasshoppers. Not only do these pests fray the leaves and eat the foliage, but also leave unhealthy droppings in their wake. Cider Vinegar – adding a teaspoon of this per gallon of water helps to keep mildew from accumulating on the plants. Unlike other fungi, powdery mildew can form in dry conditions as well as wet, bearing up against both heat and cold. A breeze will spread the mildew spores through the garden. 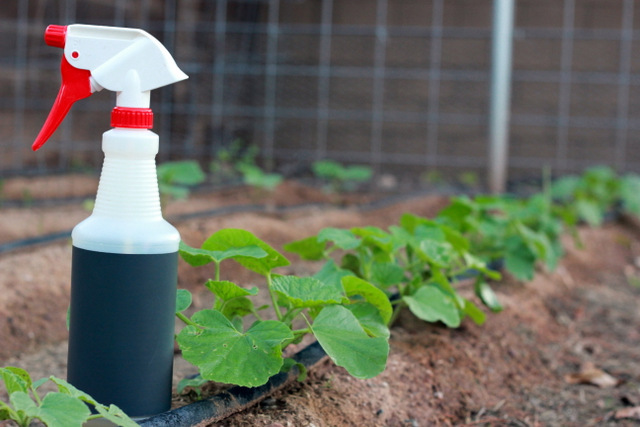 Virtually any spray bottle or garden applicator works to spray the soap. One caution is to make sure the bottle or tank is clean before filling it. Any residue of chemical pesticide or herbicide can taint the soap and injure the plants. Also, it is helpful to bear in mind that insecticidal soap works best against soft-bodied species – spider mites, mealybugs, aphids etc. Beetles and other types with hardened shells may be more resistant to natural pesticides. Nevertheless, best to start with less drastic pest control before graduating up to something more environmentally injurious. One more positive to be said for insecticidal soap is that it is fairly safe for those insects that enhance garden growth, such as the bumblebee, beneficial nematode and moth egg parasite. All said, making it at home is a cost-effective and ecologically friendly way to protect both the plants and their surroundings. Hey Buddy!, I found this information for you: "How to Make Insecticidal Soap: Garden Safe Recipe". Here is the website link: https://backtofarm.com/insecticidal-soap/. Thank you.